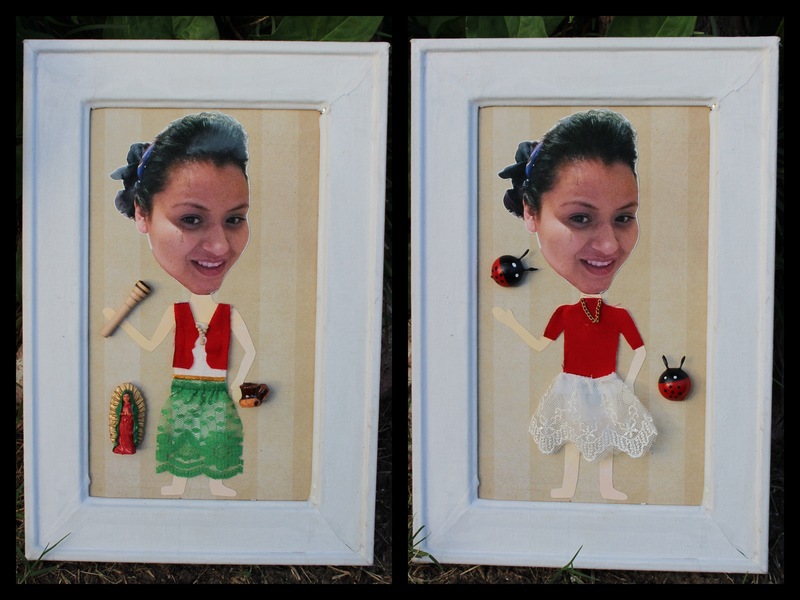 The Crafty Selfie - Fueled by chile, frijoles & tortillas. Here’s a fun way to keep kids busy, over and over again. This craft will need to be constructed with adult supervision, but it definitely won’t take long to put together. In fact, I’m almost certain you’ll want to join in on all the fun after you read this blog post. All you really need is a little creativity, and you can bring any scene you can imagine to life. A picture frame – I prefer using a wooden frame, and bought all of these for less than $2 each at a local thrift store. 2 types of crafting paper – Any craft paper will do. You’ll use one for your background, the other for the body of your little crafty selfie. Metal square sheets – As many as may need for your creation. These can be purchased at any hardware store. Choose the sheet size according to the size of the frame you will be using. A body silhouette for your selfie – You choose how you want to look. Fabrics to make clothes and other miniature items as desired. Adhesive – The adhesive of you choice as long as it is strong enough to hold cardboard, metal sheets and the craft paper you are using in place. I used Aleens tacky glue and E600. Magnet strip or magnets in small/tiny forms – I purchased a magnetic strip roll at my local dollar store. 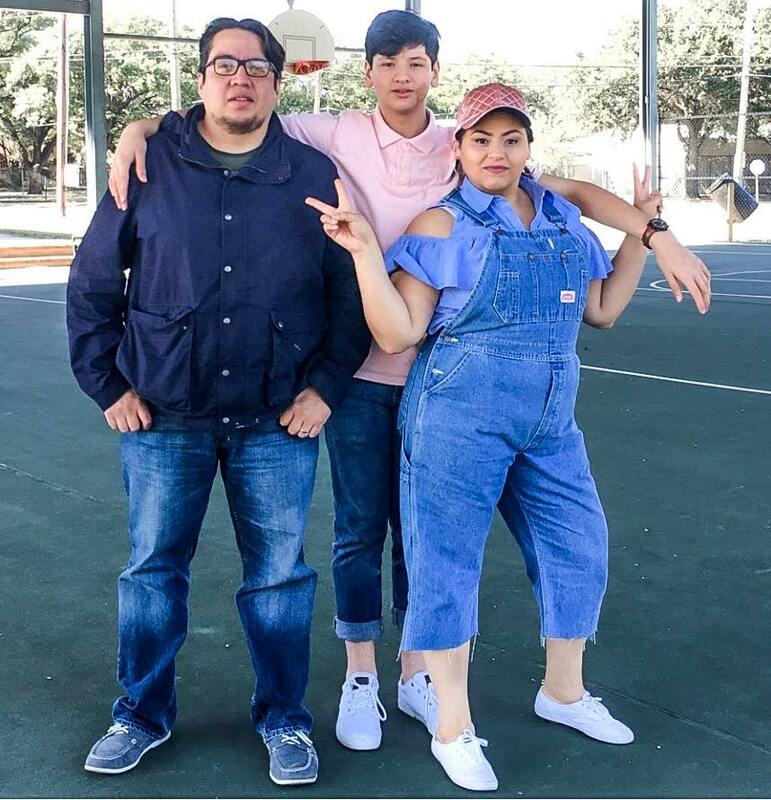 Picture of whoever’s selfie you would like to create – I really enjoyed playing with the funny faces my nephew makes along with Juan’s face. First, remove the glass from your frame, as well as all the papers and backboards within it. You will want to save the backboards, but the rest of the items can be discarded. If you don’t have a backboard, don’t worry. You can create one very easily with cardboard. Second, measure the inside of your frame, and add about 1/4 of an inch to that number. 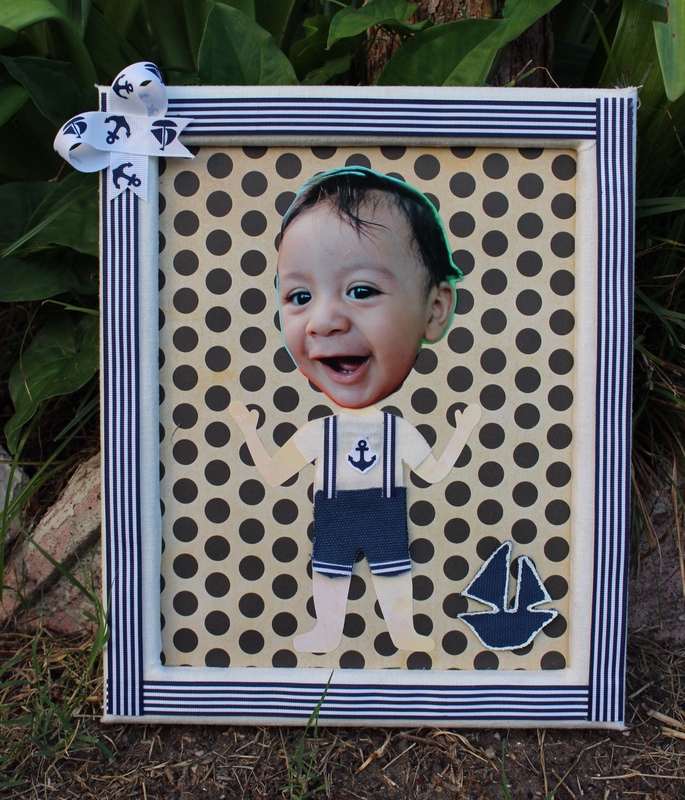 Now, if you wish to decoupage your frame to give it a more creative look, stop here and do that. Next, print your body silhouette. Place it on the craft paper of your choice and trace it on the craft paper so you can cut out the silhouette. 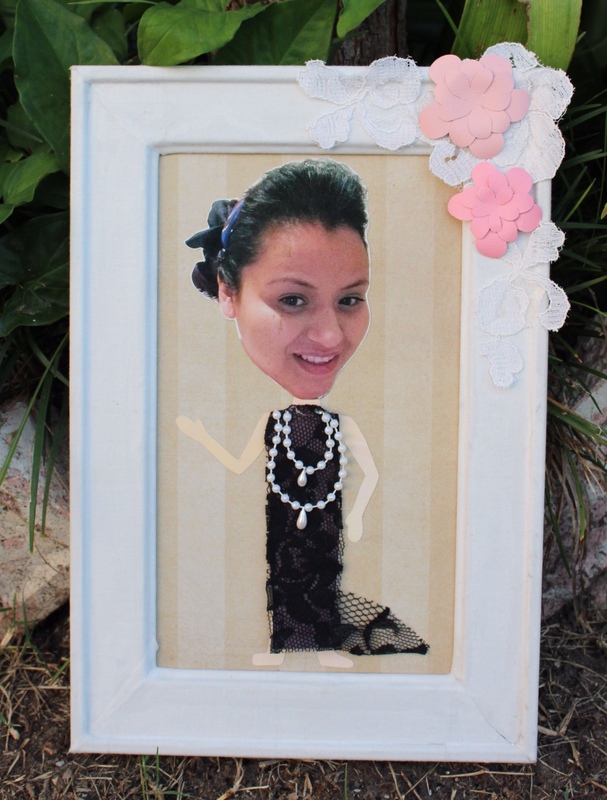 You can also use this silhouette to make miniature clothes for your crafty selfie. Once done with the above steps, you can use a lighter adhesive like Aleens glue to attach your background crafting paper to the frame. Turn your frame upside down in order to do so. Make sure you are attaching your paper so the background you want will be on the front side of the frame. Now glue your metal sheet or sheets to backboard making sure that the metal sheets are centered. This will give you more space on the frame. 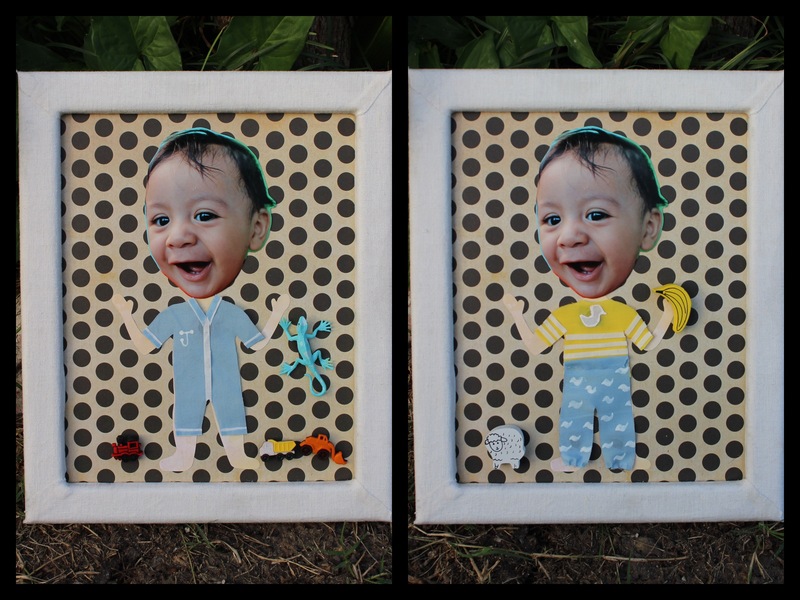 Next, adhere the backboard with the metal sheet or sheets attached to your picture frame. 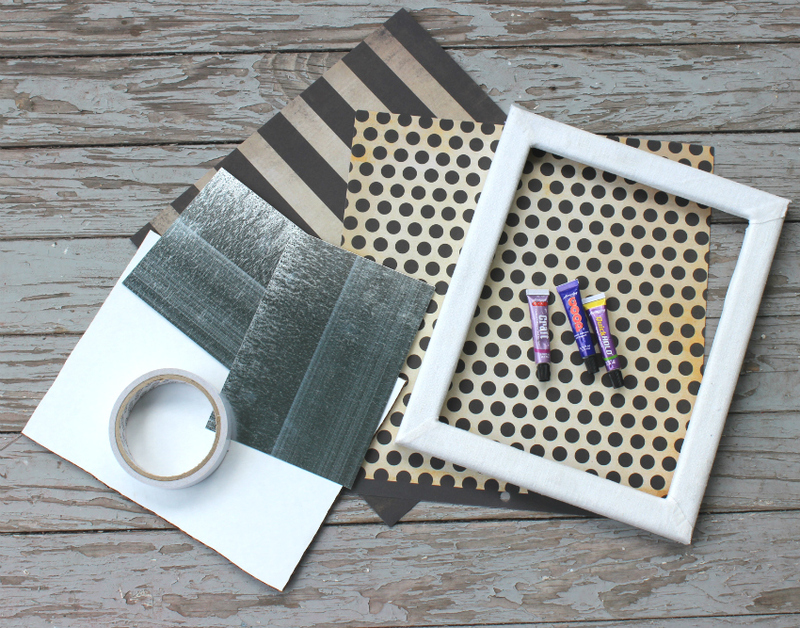 The metal sheets should be sandwiched between your craft paper and the backboard. Last and most importantly, adhere the body silhouette on frontside of your frame at the center of your background. 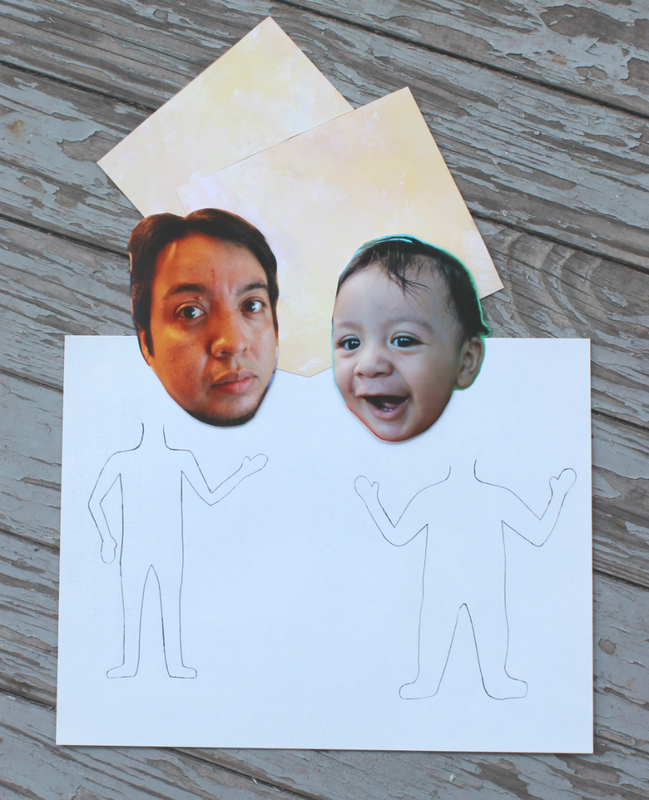 Leave enough space to paste your face, and make sure the silhouette is laying on top of the metal sheets (you’ll use the metal sheets to magnetize). I used double-sided tape to adhere my faces. Your crafty selfie is almost done. Here is where the fun really begins. 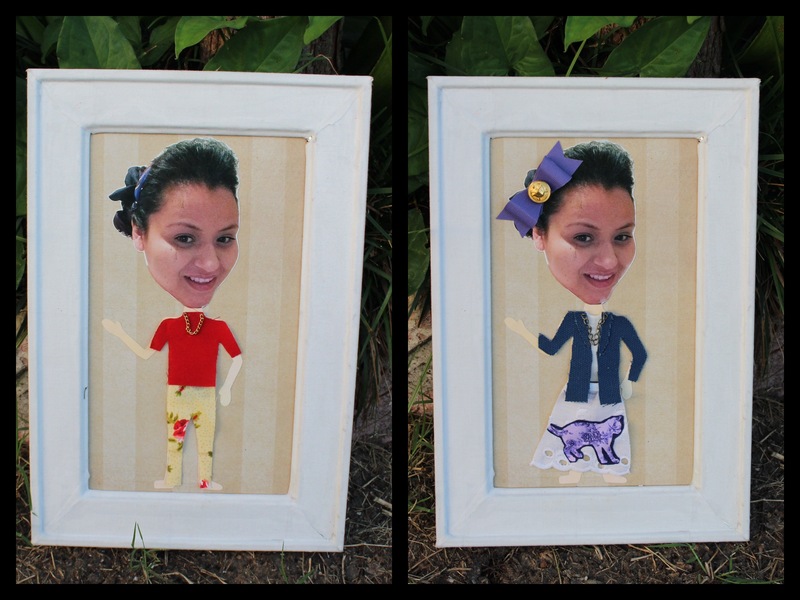 You will want to let your imagination run wild when deciding how to dress and decorate your crafty self’s selfie. Using fabrics, paper, beads, trims, lace, cabochons, ribbons, paints, unused jewelry, etc., etc., to create your miniature character’s clothing and accessories. 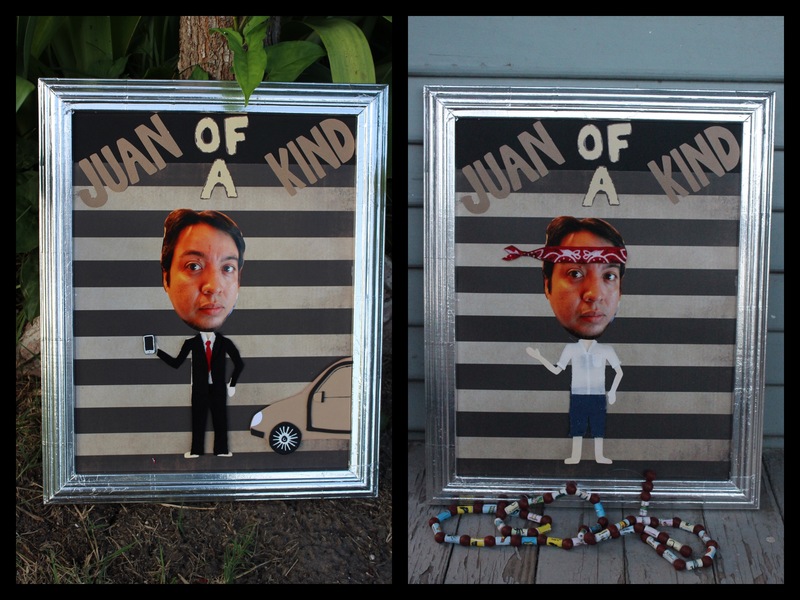 I had so much fun coming up with things to add to my frames below. Seriously it’s lots of fun. I guarantee it! BONUS!! Click the image below to download the body silhouette for your crafty selfies. This is wonderful! Now I want to make one.